2019 is a monumental year for Medair as we celebrate 30 years of service. In the months leading up to the anniversary, we are looking back at our beginnings to reflect on how far we’ve come and how many lives have been impacted, thanks to our family of supporters. 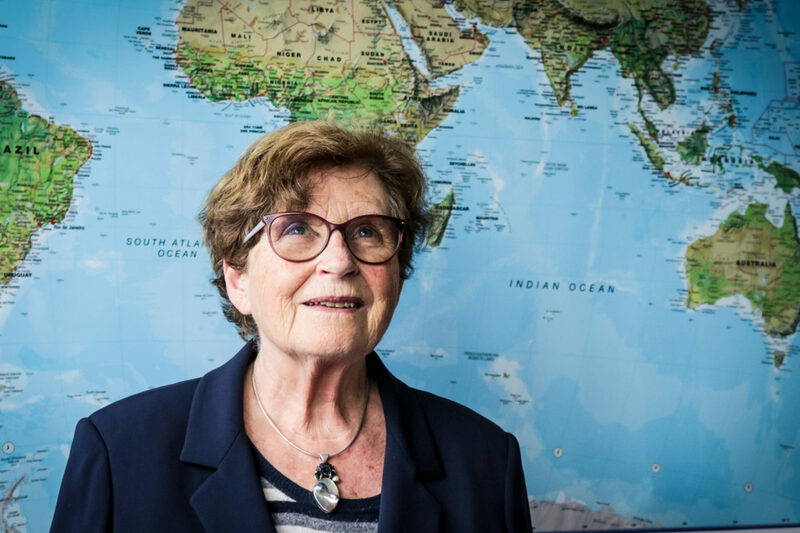 Here we sit down with Dr. Josiane Volkmar-André from Chardonne, Switzerland, who started Medair together with her husband in 1989. What motivated you to start Medair in 1989 with your husband? I was an emergency doctor and my husband was a dentist and manager. We both worked in humanitarian contexts for a number of years, together and separately. I worked in a refugee camp in Thailand, in a children’s hospital in Cambodia, in integrating refugees from Southeast Asia in California, and then in Lebanon during the civil war. My husband had worked in a hospital in Chad during the civil war and famine. When we came back to Switzerland in late 1987, three organizations who knew us well on the ground—Mission Aviation Fellowship (MAF), MEDAF, and Youth With A Mission (YWAM)—proposed that we jointly launch a project devoted exclusively to responding to crises and disasters. They had the idea to name it Medair. The idea was exactly the same vision we had when we returned, so we agreed to start it. After some intense discussions, we met in June 1988 to put the idea in writing and registered the Medair association. We didn’t waste much time before we launched our first response, which was in northern Uganda in the Teso region amidst the civil war that was happening there at the time. We began providing emergency relief to communities with the financial support of MAF and YWAM, as well as many contacts in Europe—friends, families, churches, MEDAF, and the Swiss Confederation through the Swiss Agency for Development and Cooperation (SDC). This first program, being very successful and highly regarded by the Ugandan authorities and the three parent organizations, proved that we were moving in the right direction. Medair was registered in Switzerland in 1989. What do you think is at the core of Medair’s mission, present from the beginning? We were inspired to start Medair because of the teachings in the Bible that say, “I was hungry and you gave me food, thirsty and you gave me something to drink.” In that way, Medair has always sought to provide concrete help to people experiencing immense suffering—no matter their race, nationality, gender, or religious affiliation. We did this and continue to do this by carefully taking into account the details of the context, the affected people, and their communities’ unique needs. Medair has also strived from the beginning to go to the hardest-to-reach places—places that are under-served by other organizations—to ensure that remote communities are not forgotten. Ultimately, it’s the care for people and the personalization that continues to be at the heart of Medair’s mission today. What is your view today on the organization almost 30 years later? I am proud of Medair because it has maintained its values and mission, even though it has grown to be 4 times larger than it was when we left at the end of 2003. Medair is recognized and appreciated as an emergency relief organization in the countries where we work, as well as respected by private and institutional donors. That is a great place to be as an organization. What do you want for the next 30 years? That Medair would continue to demonstrate a lot of kindness towards others, and for the organization itself, that it would continue to grow and multiply to reach more people in need. Or as we say in French, bon vent.